True. The closest chain to the kind of food the serve here would be Daphne's and I can see this meal being at least 10 bucks without the drink! And then there's the quality. I, too, would miss this if I were away from it for too long. Really a good, simple meal that everyone, whether they are from the Middle East or not would love...charred meat, good rice, and a jiuicy grilled tomato! ummmmm...people....its mostly RICE. Rice does not cost much! It would be like putting 2 ounces of rib eye steak on 1 pound of mashed potatoes and charging 10 bucks. All the reviews would come in "Hey, at Diamond Dogs place, its suce a deal and WHOA...those portions are HUGE"
I don't usually comment on blogs, but I thought I would, just this one. While it is true that rice "does not cost much", chelo, that's what we Persians call this preparation of rice, is not as easy or simple as throwing some grains in a rice cooker. To do it properly, Persian rice takes more time and effort than the meat. To prepare it right, you need to soak the rice in salted water for at least 2 hours, then drain. You cook it with more water for a few minutes until it is barely there. Then you mix it up with yogurt and butter and steam it gently to finish until it is fluffy. The yellow part is done by taking a few spoonfuls of the cooked rice and adding saffron. And if you did all this correctly, you should also get a crisped crust of rice on the bottom of the pan called tadig. It's the best part of it all. So, yes it's MOSTLY rice, but to me, that's like saying the Earth is mostly just water. True. It is. but without water, there is no life. And without this rice, there is no dish. By the way, I love you Elmo, but your picture didn't do the dish justice. 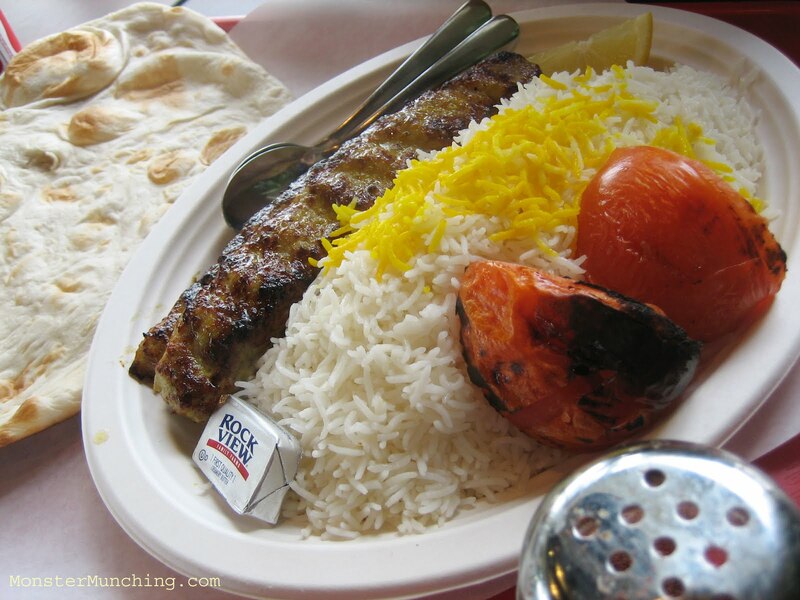 The koobideh is much larger and more plentiful than what it appears in the photo. I usually can't finish it by myself. Maryam said it best: this rice is indeed special. And yes, I didn't do the dish justice. There were actually TWO, I repeat TWO, long, thick, juicy tubes of koobideh! And Christine, yes!! This is the one time that the rice is the equal of the protein it accompanies!